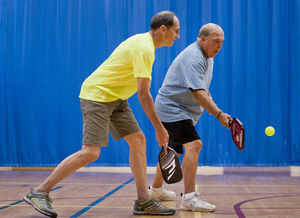 Pickleball is an ever-growing sport that has become popular for people of all ages, and it is gaining momentum at the YMCAs in Mocksville and Clemmons (NC). Scott Spillman, who is the Associate Executive Director at Jerry Long, said it has 25-40 people play on Mondays, Wednesdays and Fridays. Kim McClure, who is the Executive Director of Davie YMCA, said there are 15-20 people who play on Monday, Wednesday and Friday mornings from 10-noon. There is also a group 4-8 of Livestrong cancer survivors who play on Tuesday and Thursday from 7-9 p.m. According to her, people range in age from 12 to 80. Jordan McCallister, who is 12, and her brother Alec, who is 14, regularly play on the two courts that are set up on the basketball court at the Davie Y.